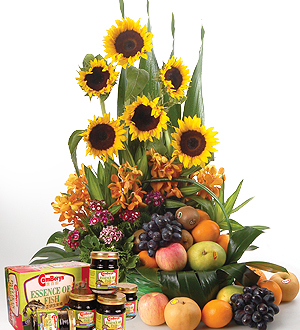 An orchard-fresh gift of grand proportions and 6 bottles of Camberyn's Essence of Fish 70cl presented in a handsome basket with sunny Sunflowers. At least 5 types of hand-picked varieties of juicy fruits to be savored. Same day delivery applies for order made before 12pm on a working day. For out of Klang Valley, Malaysia delivery, basket and accessories displayed are subject to availability and may be replaced with similar or higher value items. Call Giftlab at 03-78830233 / +6012-6915200 or email us at sales@gift-lab.com for assistance.